While moving through the markets of Nadiad, it would surely not be a miracle that, the curiosity of shopping inside you, would not hold you from shopping. It creates joy for every moment you visit the different stores, be it a footwear stores or the jewellery shops, it could be either the furniture showrooms or the boutiques or handcrafted items. 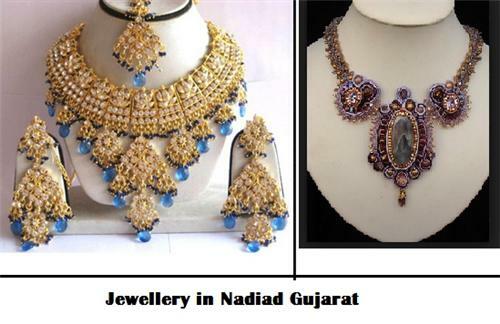 Nadiad is famous in selling fancy boutiques, beaded and gold jeweleries, as well as wooden furniture. However, the excellent gold and metallic jeweleries forces you to empty your wallet. Even fancy fabrics are too close to your shopping desires. Well, you are now aware of what all you can buy at Nadiad, so what are you waiting for? Get more bags with you, so that you can fill your bags with many interesting items to gift your family and friends. Amongst several forms of jewellery in Nadiad, the ornaments made out of agate, silver and beads are most common. Nadiad Ornaments such as the rings (ear rings, nose rings and finger rings), as well as the bangles, chain or necklaces, and bracelets, etc. are manufactured locally and sold all over the city. Silver jewellery is manufactured out of the silver bars which have great demand, and have been first converted into the sheets and wires, then into the bangles; later, transformed into the nose pins and ear rings; then, converted into the anklets and other ornaments. For instance, if you are looking to buy wedding rings, you would never compromise or hold yourself, in buying the stunning jeweleries from Nadiad. You can get the benefits of choosing special gold rings for your engagement or wedding, which enhances any kind of gemstone looks of varied colors. You can find an array of various wedding jeweleries apart from the ring. These jeweleries are the mixture of different kinds of diamonds, rubies as well as emeralds and true diamonds. While, the best white gold that comprises with the elegance of other jeweleries, makes any jewel of different colors to rock. Creative Handicrafts depicts the women in producing varied numbers of handicrafts which comprises of soft and hard toys as well as other essential household items, and thereby market them. While, fairs are the main place for the artisans to sell their handmade creative handicrafts. However, there are certain handicrafts shops as well as individual people in the Nadiad market who sell handcrafted items. If you want to decorate your home with stuffed toys, wall hangings, puppets, and other artistic handicrafts, you must walk through the Nadiad Market, where you will find a large number of options to buy handicrafts. Durries (rugs), carpets or floor spreads, shawls, etc. are very creatively done by the handloom artists of Nadiad. Even if you are looking for Asan Patta and Doormat, you will get them here at an affordable price. If you are looking for sarees or dresses, or any other garments, you must move around in Nadiad to find several garment shops. You can find everything from Traditional Ikat Saree to woolen shawls and stoles, as well as the dresses, and so on. The quality of these materials will definitely give you more pleasure in wearing these boutiques. As you commonly know that, iron Furniture neither have options to select, nor they are attractive compared to the wooden furniture. These wooden furniture plays a prominent role in creating a pleasant and charming atmosphere in your home. Among many woods, one can focus more on Mango wood or Rosewood, Oak and Teak-wood are the best selection for your furniture outdoors. When you plan to buy the furniture outdoors, you can select hardwood that withstands the factors of the nature in a better way. In the budget point-of-view, you can select Rosewood for other doors, but for the front doors, let the Teakwood be your first choice. If you want to decorate your home using a fine wood, the budget may obviously raise up, but never give-up the quality. The craftsmanship that you are looking for, would help you bring down your choices. If you love complex detailing, then you can buy the Finewood furniture from the city of Nadiad. Comments / Discussion Board - What to buy in Nadiad?